Courses for students wishing to complement their English learning experience with specialised afternoon activities. Students who are passionate about cooking can take advantage of this unique course and combine morning English lessons with afternoon or evening cooking lessons at a local food and kitchen shop. Course description: This course is a combination of 20 lessons of General English and 3 cooking sessions per week. Cookery lessons will take place at a local food and kitchen shop where anyone can learn to cook and make great food. This course aims to help the novice cook become more confident at preparing a meal and also to inspire the competent cook when creating a dish. The emphasis is to empower cooks of every level. Work stations at the kitchen shop are usually shared with one other participant, making this an excellent opportunity to further practise your English. Cookery class themes include: Chop, Dice & Slice, Thai Curry, Bouillabaisse, Perfect Steak, Pasta Master, American-Style Chilli and others. Please check with the school for further details on seasonal cooking classes. Each lesson includes teaching, demonstration, cooking and eating, use of an apron and tools. 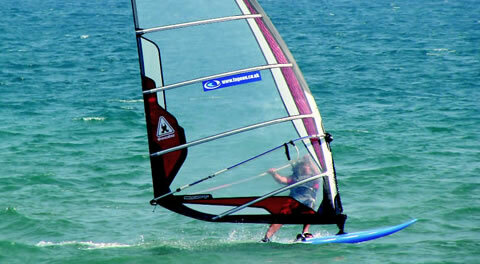 Those students who are passionate about watersports can now take advantage of Brighton's seaside location and combine morning English lessons with windsurfing in the afternoon. Course description: This course is a combination of 20 lessons of General English and 10 afternoon windsurfing sessions per week. Students who are new to windsurfing will learn about the equipment that you use and wear, practise how to windsurf on a simulator before suiting up and getting on the water, learn about the wind and how to steer and turn around, join in fun races and freestyle demos to improve sailing and much more. Those students who have reached Intermediate level will have the opportunity to use more advanced boards and sails, learn to use the harness and master new freestyle tricks. Students who are passionate about watersports can now take advantage of Brighton's seaside location and combine morning English lessons with wakeboarding in the afternoon. Course description: This course is a combination of 20 lessons of General English and 5 afternoon wakeboarding sessions per week. Brighton is home to the first wakeboard cable on the South Coast. Cable wakeboarding is a high-speed action sport and one of the fastest growing water sports in the world. The rider is towed by a cable at around 20mph performing jumps and tricks. It's exhilarating, exciting and extremely addictive. The perfect study trip for anyone with a passion for comedy, drama, music or the performing arts! The course gives you a fantastic opportunity to improve your English communication skills whilst immersing yourself in an unforgettable cultural experience at the world-famous Edinburgh Festivals. Course description: This course is a combination of General English, festival-themed afternoon lessons and 6 accompanied festival shows per week. The afternoon sessions are designed especially for our Festival students, giving you an insider's guide to one of the world's largest festival programmes. At the start of every week, you will work with your teacher and classmates to decide which shows you will go to as a group and after every show you will write a review, giving your feedback to the group. Understanding the festivals: Discover the different venues and festivals, with their varied history and architecture. You will even visit an iconic venue and see behind the scenes! Literary genres: Learn the skills required to review a show and study famous British genres, from contemporary pop culture to great Shakespearian plays. Understanding performance: What does it take to write a script? Who is involved in staging a show? You will explore these themes and more in our performance and creativity workshops. Guest workshops: To give you a real inside view, each week an industry professional will visit your class to run a session about their area of expertise – from producers and directors to performers. 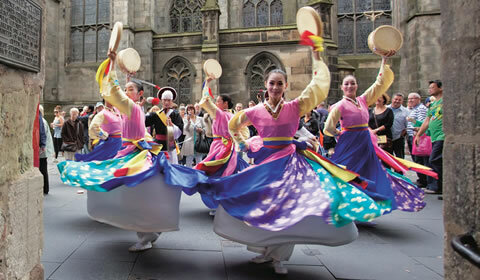 6 accompanied festival shows per week plus plenty of time to explore Edinburgh and attend extra shows with classmates. Please note that we offer a combination of paid and free shows taking place in the afternoon or evening Monday to Friday.